Bad news for the economy is no longer good news for the stock market. The Federal Reserve is now on hold, and indicated clearly in minutes from its last meeting released Wednesday that it will not only stop raising interest rates for now but will stop shrinking its balance sheet in the second half of the year, potentially giving a boost to markets. So after a stream of negative economic data Thursday, traders saw little reason to bid up stocks on the hopes the Fed would ease up on policy . The stock market on Thursday slumped after a string of reports that missed expectations. 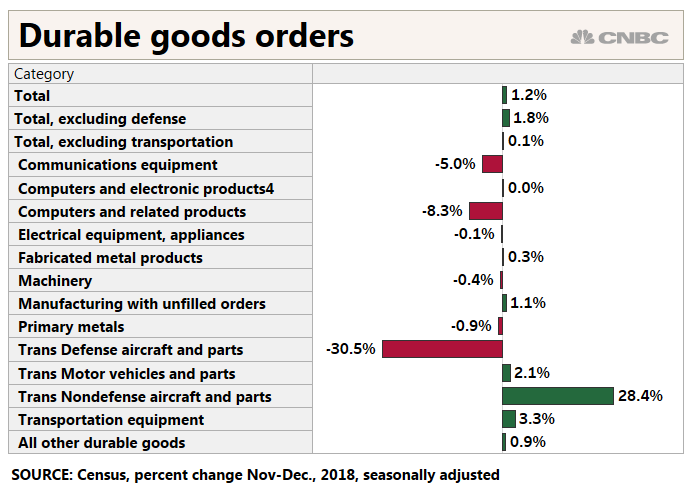 December’s durable goods data showed a surprise slowdown in business spending. The Philadelphia Fed manufacturing survey fell to minus 4.1, the first negative number since May 2016 and the biggest drop since August 2011. Markit PMI data also showed manufacturing activity at the slowest pace in 17 months. Some really bad data, however, could have a negative effect. The Dow fell 104 points a week ago Thursday, after December’s retail sales report showed a sudden, unexpected drop of 1.2 percent in spending, at a time when consumers should have been shopping for holiday gifts. Some economists wrote off the number as suspect, but it still rattled markets and sent Treasury yields lower. Yields move opposite price. The declines on negative economic reports have been modest, relative to recent rallies. But if the data continue to be negative and worsens, the reports could stir more fears of recession. “The loss of economic momentum appears to have carried over into the first quarter. In light of both a quiescent inflation backdrop and a projected downshift in GDP, imply an increased likelihood that the Fed’s next move in interest rates is lower,” wrote Joseph LaVorgna, chief economist for the Americas at Natixis. Economists definitely see a slowing economy, and on Thursday J.P. Morgan economists cut their forecasts for first quarter growth to 1.5 percent, on top of a lowered 1.4 percent for the fourth quarter. Many economists still see growth holding just above 2 percent. But one problem is that the government’s 35-day shutdown, not only could have been a temporary negative drag on the economy, but also slowed the release of economic reports, creating an even murkier-than-normal look at economic activity. While durable goods for December rose 1.2 percent, economists were watching the core capital goods orders which fell 0.7 percent, on top of a decline of 1 percent in November. That number reflects capital equipment, or business spending, an area that was expected to have been boosted by tax reform. Stocks have been boosted by optimism over trade talks with China, but it’s clear the Fed has been watching the impact of trade on the economy as one of the risks behind its decision to hold off on rate hikes. When the Fed first began discussing a potential “pause” in rate hikes in December, stocks were selling off and the markets were gripped by fear of a potential recession. Some of the fogginess around the data is expected to lift as the economy moves away from the government shutdown, which was started in late December but mostly spanned the first weeks of January, in the first quarter. If the trade discussions between the U.S. and China lead to an eventual deal, economists expect the economy to reflect the end of uncertainty and it could pick up. Even so, J.P. Morgan economists are expecting growth to pick up to 2.25 percent in the second quarter.